Our title comes from a poem by the English atheist, feminist, pacifist, and socialist Margaret Postgate-Cole. The Falling Leaves dates from 1915 and is one of her poems about the First World War. The poem has a curious feeling of serene detachment and the writer draws a parallel between the falling leaves and British soldiers falling in battle, dying “like snowflakes falling on the Flemish clay.” Around this time the poet was a classics teacher at St. Paul’s Girls’ School in West London where the Director of Music was composer Gustav Holst. 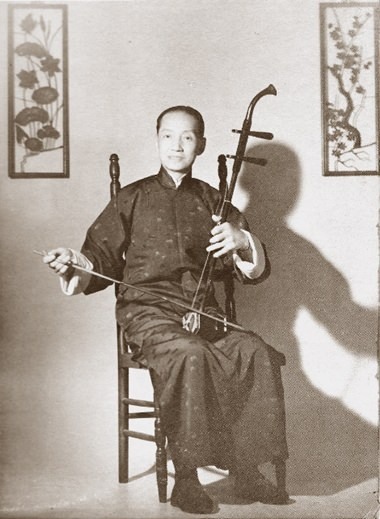 Composer Lü Wencheng playing the two-stringed erhu. I suppose to many people, the phrase merely suggests autumn. In case these things interest you, the word “autumn” has its origins in ancient Etruscan and was borrowed by the neighbouring Romans to become the Latin autumnus. It was transformed to the old French word autompne and the curious-looking word autumpne in Middle English. The popular American word for autumn has its origins in the Old English word feallan and the word “fall” was also in common in sixteenth century England. During the seventeenth century, immigrants to the British colonies in North America took their language with them but the word “fall” gradually became obsolete in Britain. In many countries, autumn also has a strong association with the end of summer holidays and the start of a new academic year and therefore especially significant for students and teachers. It’s associated with the change from warm to cold weather, and in poetry, it has often been associated with melancholia. The hopes and delights of summer are gone and the grey chill of winter is ever-approaching. On the island in northern Europe where I spent my childhood, the autumn – especially late autumn – could be a joyless time of year with only the prospect of bleak grey winters and dismal weather. It was a time – both physically and mentally – to turn inward. The subject of autumn has proved irresistible to many composers. Red Autumn was written by the English composer Arnold Bax, not by a Chinese communist one as you might reasonably suppose. Frank Bridge, another English composer wrote In Autumn, Edward Grieg composed An Autumn Overture and a similar theme was used in works by Debussy, Panufnik, Takemitsu. You can probably think of some others. This allegorical single-act ballet was composed in 1899 and consists of four scenes or tableau representing each season. It was first performed the following year by the Imperial Ballet in St. Petersburg. The entire Imperial Court showed up for the premi่re which featured the legendary ballet dancer Anna Pavlova. She was one of the few artistes who gave her name to a dessert. Another with this dubious honour was of course was soprano Nellie Melba whose real name, incidentally was Helen Porter Mitchell. She borrowed the pseudonym “Melba” from her home town of Melbourne. The Seasons ballet runs for nearly forty minutes and contains a wealth of captivating music in which Autumn is the fourth and final tableau. In the original version a lively Bacchanal opens and closes the movement but in this video it appears only as the closer. The performance begins with the delightful Petit Adagio, full of lovely melodic writing and richly satisfying orchestration. It’s followed by the rhythmic Variation du Satyre and concludes with the ebullient Bacchanal which contains reminders of John Williams’ theme from Star Wars. Or perhaps it’s the other way around. Glazunov was a student of Rimsky-Korsakov, one of the great masters of orchestration. And it shows. Lü Wencheng (also written as Lui Man-Sing) was a Chinese composer and musician born in Zhongshan, a city in the south of the Pearl River Delta in Guangdong Province. He grew up in Shanghai and became a master of Cantonese music and Guangdong folk music. In 1932, he moved to Hong Kong where he lived for the rest of his life. He wrote over a hundred compositions, many with pastoral-sounding titles such as Flowers falling from sky, Intoxicated by the easterly wind, Meeting in the Milky Way, Fisherman’s song at dusk and so on. Much of his music has a hypnotic and tranquil folk-song quality. Autumn Moon on a Calm Lake was composed during the 1930s and is one of Lü’s most well-known pieces. The composition was evidently inspired by the composer’s visit to the famous West Lake in Hangzhou, Eastern China, considered a place of tranquility since ancient times. Chinese poets have written about it since the twelfth century. The music is atmospheric and this Debussy-like piano transcription is in the repertoire of many Chinese pianists. The distinguished pianist Lang Lang provides a compelling performance of this charming, if ever-so-slightly kitsch composition. Next articleJesters Gala Party Night is this Saturday!